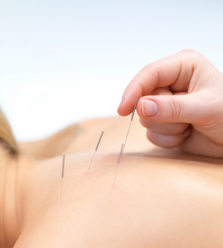 Acupuncture and Chinese Medicine have been practiced for over 2000 years. It's a holistic therapy that works on balancing the mind, body and spirit, and began when it was found that stimulating certain body areas had an affect on an organ. This led to the development of this important system of healing. There are two types of acupuncture practiced in the UK. These are Traditional Chinese Medicine (TCM) and Five Element acupuncture. In this Clinic I treat using a combination of the two together to give a complete treatment. It works by inserting needles into channels (also known as meridians) around the body. These channels, or meridians, contain an energy known by the chinese as 'Qi' and it is this 'Qi' of the body that can become stuck, deficient or too full, causing illness to occur. By carefully inserting needles (a normally painless process) into selected points on the channels, a rebalancing of the energy begins to occur helping the body to restore itself to full health and well being. As well as needles on occasions other methods of practice might be used during a treatment to assist in the progression of health. Moxibustion is the use of a special herb, called mugwort, being lit above acupuncture points. The quality of mugwort is of a heating nature and helps to warm the chosen points, aswell as other qualities. Moxibustion is very good at helping to turn breech babies. Cupping involves the use of glass cups, that are placed on different parts of the body. A vacumm is created by the cups helping to move stagnant 'Qi'. This practice is not painful, but may leave a circular red mark. A full explanation and your permission will be gained prior to use. Any further questions please either use the contact form or the other contact methods.